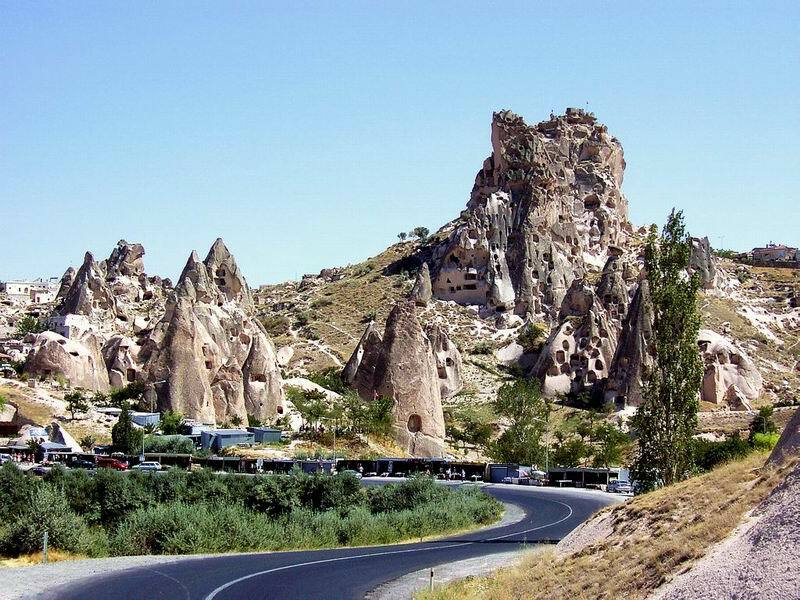 If you visit Cappadocia from the Nevsehir way, the first interesting destination is Uchisar. It is newly known for its cave hotels widely known in the world also these cave hotels are not as their names. Not a cool cave but a luxurious accomodation in this region. When it comes to talk about Uchisar Castle, It has a fantastic view to the valleys of Goreme and Pigeon Valley. If you climb this castle in a summer day you should choose afternoon or also you can wait for sunset. It is one of the best points to see the sunset. But in my opinion, it is not the best as in Goreme, Aydinkiragi. If you visit Uchisar from Goreme, there is a bus in every half hour from the bus station in the centre. It takes 10 minutes to Uchisar and it is 2,5 TL(1 dollar) per one in October. If you think you are a walking/ hiking master you can also try walking from Goreme to Uchisar. It will take a half hour maybe more.There are 3 viewpoints between Goreme and Uchisar, these places are private shops also. You can have rest there and take photos of the valleys too. If you rent a car I think it is a must to stop there and watch this fantastic view. Finally, don’t forget to see around in Uchisar. On the right side of the castle there are also nice scenes and caves too. P.S: If you go with bus, tell the busman stop in Uchisar. Bus stops under the Uchisar castle in front of the shops to get passengers, but it is far so don’t leave the bus there because it is really hard to go up. After a few minutes from there, the bus will climb to top and leave you on the main road to Uchisar. You will cross the road and walk about 500 or 600 meter directly passing next to the Souvenir Shop there.